UPWARDS of 8000 to 10,000 Merino sheep a year are planned to pass through a new fully-automated feedlot at Haddon Rig in Warren. Established in February this year, the feedlot was an initiative taken by the management team at the beginning of the drought to assure the productive capacity of the company in dry periods, and make the most of strong lamb prices. Supporting the feedlot is a centre pivot irrigation system of three circles totalling 120 hectares to grow high value fodder crops for grazing. Haddon Rig principal George Falkiner said when the dry period began the company made the decision to invest in feedlot and pivot technology to maintain productivity and take advantage of market opportunities. Overseeing the project is Haddon Rig general manager Charlie Blomfield who said existing yards and autodraft race at the shearing shed provided the infrastructure necessary to process the increased volume of sheep from the feedlot close-by. 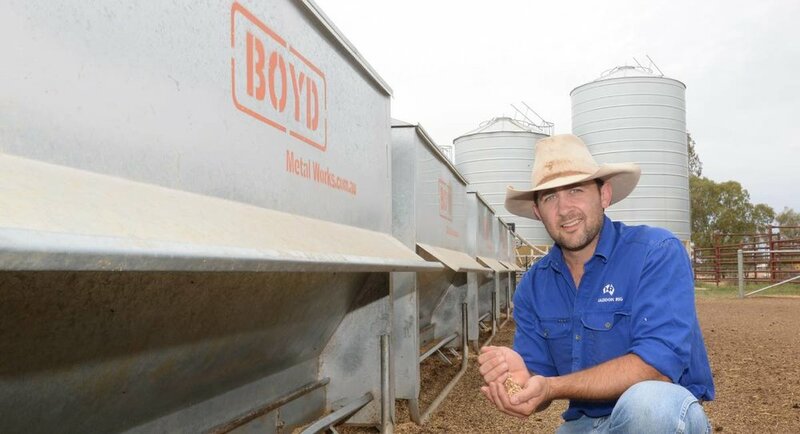 “We had been using these pens as weaning yards and now have installed automated Boyd self-feeders supplied by a variable drive grain mixing system from three commodity silos,” Mr Blomfield said. The lamb feedlot feeding systems designed and constructed by Peter and Ann-Maree Boyd of Boyd Metal Works, Cowra, have become popular. Mr Blomfield said lambs entered the feedlot at between 35 to 38 kilograms liveweight and trail-fed plus some hay for a week. “They are then moved on to a full ration from the auto-feeders at about 70 per cent cereal grain, 25pc pulses of either fava or lupins and a 5pc Ambos pellet with minerals and a grain buffer,” he said. He said they gain 260 to 280 grams a day. Weaner lambs are yarded in pens and put on Bromar feeders for the first few weeks and and receive a mineral supplement prior to introduction to the auto-feeders. Mr Blomfield said the auto-feed system had three ingredient silos at one end of the yards, which ran into a computer controlled mixing hopper and was transferred to the feeders along a corkscrew auger within PVC pipe. “We traded some Merino wethers which worked well at lower grain prices, but with high grain prices we only have Haddon Rig bred sheep in the feedlot,” he said. Mr Blomfield believes it is possible to do four or five turnovers per year and have a break from feeding during hot summer months. “The key for us is creating production flexibility. We have just started exploring direct supply of Haddon Rig Merino meat to restaurants and butchers so we need to guarantee supply and quality.”ASSURED feed and grazing pasture availability is a prerequisite to the success of an automated lamb feedlot established at Haddon Rig in Warren. Charlie Blomfield said between the feedlot, the centre pivots and the pasture-based systems, Haddon Rig could generally meet the market, which is an advantage in any season. Under a centre pivot, 96 hectares of millet is growing as well as 30ha of grazing canola from winter. The pivots would have a rotation of fodder and cash crops when irrigation water is available. Irrigation water is supplied via the Marthaguy and Tenandra schemes. Plans are to connect further irrigation areas on the property with pipelines and overhead spray irrigation to increase the flexibility and water use efficiency.